Predictably enough, the only Veterans of Foreign Wars hall in Miami Beach was difficult to find. We’d just been ushered out of the lobby of a pricey-looking condominium, where a listless doorman told us, simply, “It’s next door.” But it wasn’t next door; it was in the same building, one door over. The occasion was the setting for a celebration of the 2013 Carnegie International, the first in a series of nationwide run-up events in dives meant to evoke Pittsburgh’s blue-collar bars. Finally finding ourselves in the second-floor VFW (elevator only—no stairs), we encountered pool tables, buckets of bottles of Pennsylvania-based Yuengling (twist-off caps! ), sports on TV, and a nicotine-stained mural of Raising the Flag on Iwo Jima. Next up: cocktails at the Baibakov residence in the Setai penthouse for Matthew Brannon’s recent Lincoln Center commission. The view from the balcony terrace was breathtaking, and I, for one, couldn’t help but succumb to giggling wonder, I’m only partly embarrassed to say. (Because c’mon, do you often get a bird’s-eye view of Miami’s nighttime skyline, its tropical neon grid? I certainly don’t.) Inside, a Brannon print depicting several kinds of cheeses was for sale, displayed on an iPad that was being passed around. 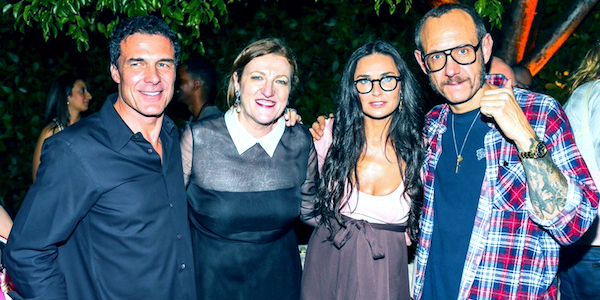 (Jeffrey Deitch, Scott Rothkopf, Christian Rattemeyer, and Cay Sophie Rabinowitz were there.) Brannon’s mood looked good. He was staying in Boca Raton. I was not invited to the two launches for AriZona Beverage’s Richard Prince Lemon Fizz, happening at W South Beach on Wednesday and at the Shelborne Hotel on Thursday. But the next day, morbid curiosity prompted me to visit an affiliated promotional “happy hour” at the faux-lux HaVen Gastro-Lounge with cocktails on offer that contained the stuff. I entered to find myself the first—and only—guest, and a PR representative handed me a drink. (It tasted vaguely like Four Loko.) Projected on the venue’s walls were video images of the Lemon Fizz can, showing not Richard Prince’s art but a dated photograph of his face, looking wan against a neon expressionist backdrop. Obligations mounted that evening, so I skipped a lot. Marcelo Krasilcic’s book launch at Lords South Beach Hotel? Couldn’t go. MoMA PS1 and VW’s Hurricane Sandy benefit at the Delano, where more than $140K was raised for the Rockaways Waterfront Alliance? Heard it was good. Moncler’s sixtieth anniversary party at that otherworldly, Herzog & de Meuron–designed parking garage? I got there too late. But what can you do? Even if time were on my side and gusts of wind at my back, I would inevitably have missed out. Traffic was bad. Cabs were few. Plus, there are those interminable South Beach nightclub lines, hot with ghoulish entitlement and cluttered with “VIP passes” and people arguing at the door. Earlier that night, though, I did get to the launch of Terry Richardson’s Hollywood-themed photobook Terrywood at the Standard Spa. I was way early. A sparse crowd milled around, looking bored. One was an octegenarian clad in all white who held a walking stick topped with a polished silver skull. He seemed to know all the Standard staff, and I wondered if he resided at the hotel—living out his twilight years taking evening strolls through fashion parties, appearing, Where’s Waldo–like, in nightlife photographs. I had to leave well before Demi et al. showed up and Azealia Banks performed, but I did witness the arrival of Richardson, signaled by a strobic flash in the corner of my eye. He walked around giving lots of thumbs-ups, and people took his picture. Left: Art Basel car. Right: Artists Sandeep Mukherjee and Arthur Ou.